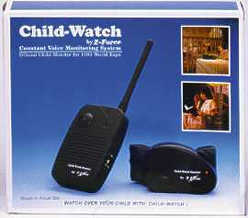 The ChildWatch monitor adds a whole new dimension to child security and safety. Early on it can be used as a conventional baby monitor. When older, the Child-Watch can be belted on the child for outdoor use. If the child is hurt, the parent will hear. If someone speaks to the child, the parent will hear. If the child falls into water, the parent will be beeped. If the child's unit is turned off or if the child exceeds a certain distance (150 feet), the parent will be beeped.